Quality heavy duty fuel hose suitable for petrol or diesel and both carburettor and fuel injection systems. Internal Bore: 3.2mm 1/8" External Bore: 7mm. Labour claims are not accepted. ALSO AVAILABLE IN SIZES 3.2mm 4mm 5mm 6mm 7mm 8mm 10mm 12mm -. 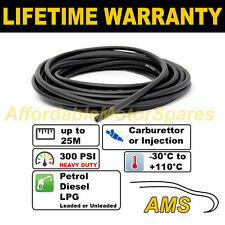 Suitable For: Leaded & Unleaded Petrol & Diesel. MLR LOW PRESSURE STAINLESS STEEL BRAIDED FUEL HOSE. 10mm (3/8") ID. Type: Stainless Steel Overbraid Fuel Tubing. Not suitable for high pressure fuel injection systems. Quality heavy duty fuel hose suitable for petrol or diesel and both carburettor and fuel injection systems. ALSO AVAILABLE IN SIZES 3.2mm 4mm 5mm 6mm 7mm 8mm 10mm 12mm -. Internal Bore: 8mm 5/16" External Bore: 14mm. 10mm (3/8") ID. 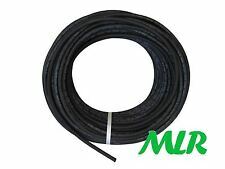 MLR LOW PRESSURE BLACK POLYESTER OVERBRAID FUEL HOSE. Not suitable for high pressure fuel injection systems. Tube: Smooth static conducting Black fuel resistant Nitrile Rubber. HOSE SPEC. Suitable For: Unleaded Petrol / Diesel / Water / Air. Most fuel injection and carb systems requiring 10mm hose. 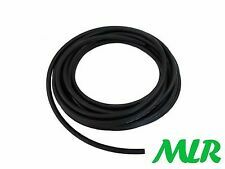 MLR HIGH PRESSURE FUEL INJECTION HOSE. HOSE SPEC Type: Smooth Black Fuel Resistant Nitrile Rubber. Quality heavy duty fuel hose suitable for petrol or diesel and both carburettor and fuel injection systems. ALSO AVAILABLE IN SIZES 3.2mm 4mm 5mm 6mm 7mm 8mm 10mm 12mm -. Internal Bore: 4mm External Bore: 10mm. Quality heavy duty fuel hose suitable for petrol or diesel and both carburettor and fuel injection systems. Internal Bore: 3.2mm 1/8" External Bore: 7mm. ALSO AVAILABLE IN SIZES 3.2mm 4mm 5mm 6mm 7mm 8mm 10mm 12mm -. 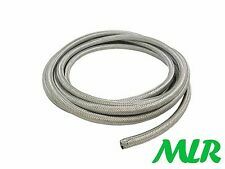 MLR LOW PRESSURE STAINLESS STEEL BRAIDED FUEL HOSE. Suitable For: Leaded & Unleaded Petrol / Diesel. 10mm (3/8") ID. Type: Stainless Steel overbraid fuel tubing. Not suitable for high pressure fuel injection systems. MLR HIGH PRESSURE FUEL INJECTION HOSE. Suitable For: Unleaded Petrol / Diesel / Water / Air. Most fuel injection and carb systems requiring 10mm hose. HOSE SPEC Type: Smooth Black Fuel Resistant Nitrile Rubber. 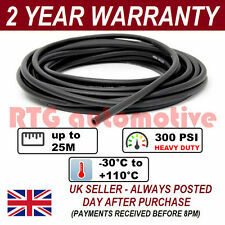 Quality heavy duty fuel hose suitable for petrol or diesel and both carburettor and fuel injection systems. - Internal Bore: 3.2mm 1/8" External Bore: 8mm. ALSO AVAILABLE IN SIZES 3.2mm 4mm 5mm 6mm 7mm 8mm 10mm 12mm -. Quality heavy duty fuel hose suitable for petrol or diesel and both carburettor and fuel injection systems. Internal Bore: 12mm 1/2" External Bore: 19mm. ALSO AVAILABLE IN SIZES 3.2mm 4mm 5mm 6mm 7mm 8mm 10mm 12mm -. Quality heavy duty fuel hose suitable for petrol or diesel and both carburettor and fuel injection systems. - Internal Bore: 3.2mm 1/8" External Bore: 7mm. ALSO AVAILABLE IN SIZES 3.2mm 4mm 5mm 6mm 7mm 8mm 10mm 12mm -. Quality heavy duty fuel hose suitable for petrol or diesel and both carburettor and fuel injection systems. Labour claims are not accepted. Internal Bore: 3.2mm 1/8" External Bore: 8mm. ALSO AVAILABLE IN SIZES 3.2mm 4mm 5mm 6mm 7mm 8mm 10mm 12mm -. 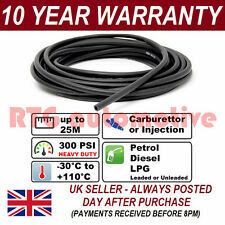 Quality heavy duty fuel hose suitable for petrol or diesel and both carburettor and fuel injection systems. ALSO AVAILABLE IN SIZES 3.2mm 4mm 5mm 6mm 7mm 8mm 10mm 12mm -. - Internal Bore: 8mm 5/16" External Bore: 14mm. Quality heavy duty fuel hose suitable for petrol or diesel and both carburettor and fuel injection systems. ALSO AVAILABLE IN SIZES 3.2mm 4mm 5mm 6mm 7mm 8mm 10mm 12mm -. - Internal Bore: 4mm External Bore: 10mm. Quality heavy duty fuel hose suitable for petrol or diesel and both carburettor and fuel injection systems. Internal Bore: 10mm 3/8" External Bore: 16mm. ALSO AVAILABLE IN SIZES 3.2mm 4mm 5mm 6mm 7mm 8mm 10mm 12mm -. 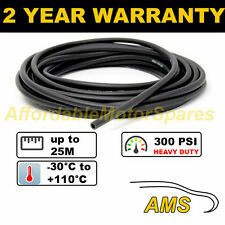 Quality heavy duty fuel hose suitable for petrol or diesel and both carburettor and fuel injection systems. - Internal Bore: 12mm 1/2" External Bore: 19mm. ALSO AVAILABLE IN SIZES 3.2mm 4mm 5mm 6mm 7mm 8mm 10mm 12mm -. 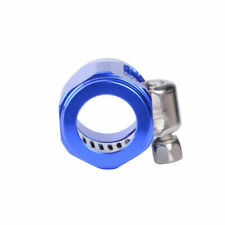 AN -10 AN10 19MM Braided Hose SEPARATOR CLAMP Fitting Adapter Bracket. 19MM hose separator clamp for adding that custom look aswell as securing and tidying up your fuel, oil, coolant lines. Can be used for other purposes as long as the O.D of your hose is 19-20MM. Quality heavy duty fuel hose suitable for petrol or diesel and both carburettor and fuel injection systems. - Internal Bore: 10mm 3/8" External Bore: 16mm. ALSO AVAILABLE IN SIZES 3.2mm 4mm 5mm 6mm 7mm 8mm 10mm 12mm -. Hose Separator Clamp Fitting AN4/AN6/AN8/AN10 Gas/Oil/Fuel Line Hose End Fitting. This item is for Racing dual hose separator. This separator is machined from high quality CNC billet aluminum and is then anodized for a quality finish and durability.This separator is designed to be used with Gas/Water/Oil/Fuel hoses to keep them organized and away from moving engine parts. AN -6 Stainless Steel Braided Rubber Internal Hose. Suits AN -6 SS Braided Hose. CNC Machined to Aerospace Grade. We will reply you within 24- 48 hours. Quality heavy duty fuel hose suitable for petrol or diesel and both carburettor and fuel injection systems. All of our products are sourced directly from our range of approved factories. All of our parts are subject to quality testing and are ISO TS16949 certified, we also search to make sure that our approved manufacturers use the latest technologies and materials available. Material: Brass. Design: 3 Way. TITLE: NYLON STEEL BRAIDED AN16 -16AN OIL FUEL GAS LINE HOSE 1M. APPLICATION: AN16 16AN. Inner of Hose:NBR CPE synthetic rubber. (2) Partial Coverage Stainless Steel Inner Braid is woven into the Inner Liner of high quality synthetic rubber nylon of outer layer braid. Application:Flare aluminium weld on adapter, weld this onto your fuel cell,oil cooler,catch tank,swirl pot or any other aluminium tank etc. Material:High Quality Aluminum Alloy. AN -6 Stainless Steel Braided Rubber Internal Hose. Suits AN -6 SS Braided Hose. We will reply you within 24- 48 hours. AN -6 Stainless Steel Braided Rubber Internal Hose. Suits AN -6 SS Braided Hose. Ti Stainless Round Curved Dual Exhaust Tip 2.5" Inlet Angled Muffler Tail Pipe. 2xFlowing High brightness Motorcycle Turn Signal Indicator Light Fish Bone Style. AN -6 Stainless Steel Braided Rubber Internal Hose. Suits AN -6 SS Braided Hose. Universal Car Seat Seam Wedge Cup Drink Holder Seat Wedge Cup Holder Mount 1x. 2.5m Black Car Front Bumper Spoiler Lip Kit Splitter Valance Chin Protector Kits. AN6 to 3/8"NPT,AN6 to 1/2"NPT,AN6 to 1/8"NPT,AN6 to 1/4"NPT. AN6 to NPT Hose End Fitting The hose end fittings are made of high quality aluminum material for strong strength. Polished and anodized surface bring bright appearance and corrosion protection. Made of High Quality Lightweight Aluminum Material. Color: Blue. Anodized Finish for Strength and Durability. Size: AN10. Anodized Finish for Strength and Durability. Color: Blue. Item; jumper tube. breaking whole bike. Quality heavy duty fuel hose suitable for petrol or diesel and both carburettor and fuel injection systems. ALSO AVAILABLE IN SIZES 3.2mm 4mm 5mm 6mm 7mm 8mm 10mm 12mm -. Internal Bore: 6mm 1/4" External Bore: 12mm. Quality heavy duty fuel hose suitable for petrol or diesel and both carburettor and fuel injection systems. Internal Bore: 7mm External Bore: 13mm. ALSO AVAILABLE IN SIZES 3.2mm 4mm 5mm 6mm 7mm 8mm 10mm 12mm -. Quality heavy duty fuel hose suitable for petrol or diesel and both carburettor and fuel injection systems. Internal Bore: 3.2mm 1/8" External Bore: 8mm. ALSO AVAILABLE IN SIZES 3.2mm 4mm 5mm 6mm 7mm 8mm 10mm 12mm -.